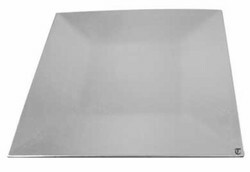 Tabletop Classics Square Acrylic Silver Charger Plate 13"
Home > Products > Tabletop Classics Square Acrylic Silver Charger Plate 13"
Use the Tabletop Classics Square Acrylic Silver Charger Plate 13" to hold square-shaped dinnerware during dinner parties and other special occasions. Attractive and functional, this charger plate features a rustic look and a sturdy construction which will endure constant wear and tear. The simple yet sophisticated design makes for a visually appealing aesthetic that will not only help prevent stains on your tablecloth, but also enhance your table setting and make your served food look enticing. Durable, stylish and economical, this charger plate is an excellent addition to restaurants, catering companies and other food service facilities.